The top speed your tires can handle is indicated by the tire speed index. Every tire has a designation indicating the top speed at which the tire can properly operate. This designation originated from the German’s Autobahn. Due to the lack of any posted maximum speed limits, tires needed to indicate their performance speeds in order to keep drivers safe. Now all tires manufactured have this designation. Here is a chart that shows how the speed ratings work, note that the higher the speed rating, the shorter the life cycle of the tire. That means if you want a tire that can perform at top speeds, you sacrifice longevity of use. Typically the letter for the tire speed index is located in the Service Description area, see graphic below. However, for Z rated tires, the designation will be in front of the R, as an example: 225/50ZR16. 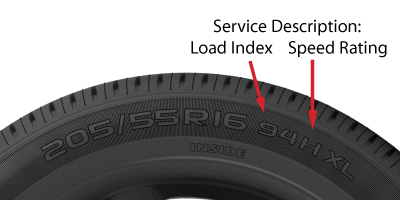 As well, with Z rated tires, there will be a second letter in the service description area indicating how high above the Z rating a tire can perform. W indicates the tire can perform above 149 mph and up to 168 mph; a Y indicates above 149 mph and up to 186 mph. The service description is a combination of the load index and the speed rating, next we will talk about load index.